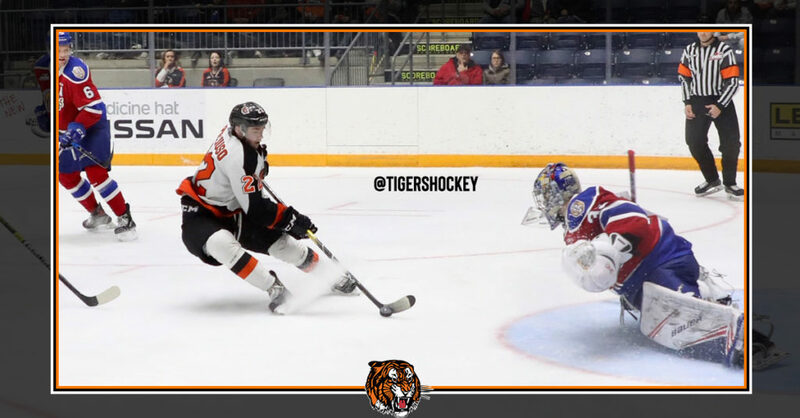 Medicine Hat, AB — The Medicine Hat Tigers fell 5-1 to the Edmonton Oil Kings in game four of the Eastern Conference Quarter Finals. After a scoreless first period, Ryan Jevne opened the scoring on the power play midway through the second stanza. Jevne’s first goal of the playoffs was assisted by Ryan Chyzowski and James Hamblin. Late in the middle frame, the Oil Kings responded by scoring three quick goals to make it 3-1 Edmonton after 40 minutes of play. Quinn Benjafeld scored on the power play to tie the game up before Andrew Fyten and Vince Loschiavo chipped in a goal each. In the third period, Loschiavo scored his second of the night on the power play before setting up Matthew Robertson to score and give the visitor’s the 5-1 victory. Rookie goaltender Mads Søgaard stopped 31 of 36 shots faced in the losing contest while Todd Scott turned aside 14 of the Tabbies’ 15 shots. The series is now tied 2-2 and the two rivals will head to Edmonton to play game five at Rogers Place on Friday night. Game six will take place Sunday, March 31st at the Canalta Centre and tickets will go on sale to the general public Thursday morning at 9:00 a.m.